She's like the Ashton Kutcher of the ape world: An orangutan in the Vienna Zoo now has a Facebook fan page to showcase the photos she takes with a digital camera. The orangutan, named Nonja, uses a Samsung ST 1000 point-and-shoot that automatically uploads the photos. 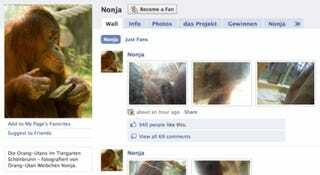 When this post was published, Nonja had over 9,000 "fans" subscribed to her page. But there's a catch: Coverage of the camera-toting ape in the U.K.'s Daily Mail explains that the camera has been modified to dispense a raisin whenever the shutter button is pushed. So Nonja is evidently more interested in tasty treats than in artistic endeavors. The non-orangutan version of the Samsung ST 1000 was released this summer (though not in the U.S.) and is equipped with Wi-Fi, Bluetooth, and GPS.